Some people have difficulty telling one small rodent from another, but distinguishing a hamster from a mouse is actually pretty easy. Sure, they're both small, furry, squeaky, and leave little droppings everywhere they go. They can even have similar coloration. But their differences are easy to spot. 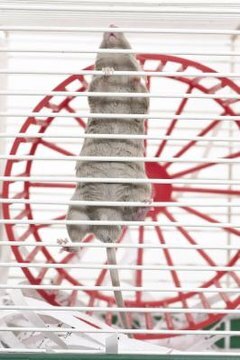 Mice vary in size, and so do hamsters. But hamsters have larger bodies and very short tails. A small mouse and a dwarf hamster can be about the same size, 2 inches, but the hamster's much shorter tail means he has a larger body than the smaller mouse. The largest hamsters are about 5 inches longer than the largest mice. Hamsters' bodies are also usually bulkier than those of mice, and they have special cheek pouches where they can store food. Mice do not have cheek pouches. Mice and hamsters are taxonomically similar, belonging to the same kingdom, phylum, class, order and superfamily. They're both rodents. There are several species of each, but each belongs to a unique subfamily. Mice belong to subfamily Murinae, while hamsters are subfamily Cricetinae.